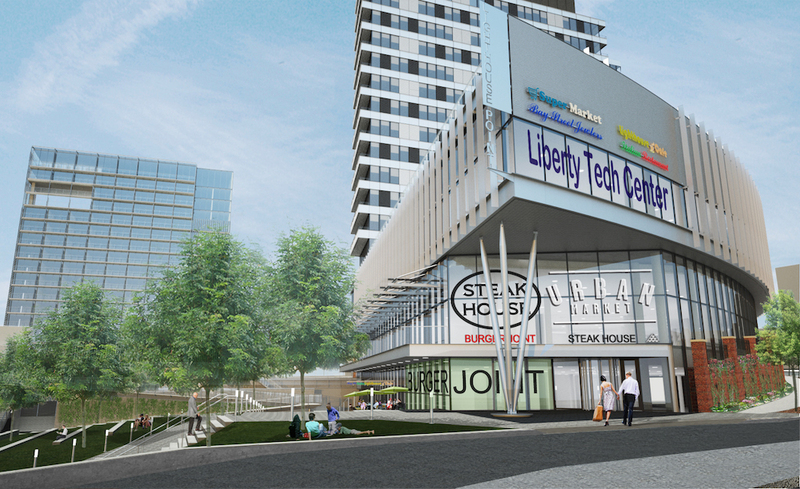 Triangle Equities is set to break ground this fall on a long-planned, mixed-use project just behind the St. George Ferry Terminal in Staten Island, and YIMBY has new renderings of the hotel-retail-residential complex that will complement a proposed 630-foot-tall ferris wheel. 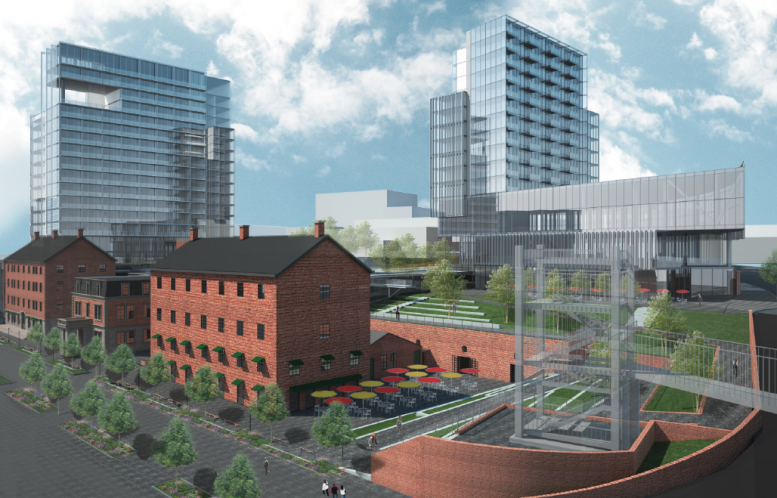 The development, dubbed “Lighthouse Point,” will occupy half a million square feet at Borough Place and Bay Street and include the restoration of the landmarked, mid-19th century Lighthouse Depot buildings. When construction is complete, there will be a 62,000-square-foot retail base topped by a 13-story, 110-unit rental building. Twenty percent of the units will rent at below-market rates to households making 60% of the Area Median Income. The apartments will be spread across 92,300 square feet of residential space, for a larger than average rental unit of 839 square feet. 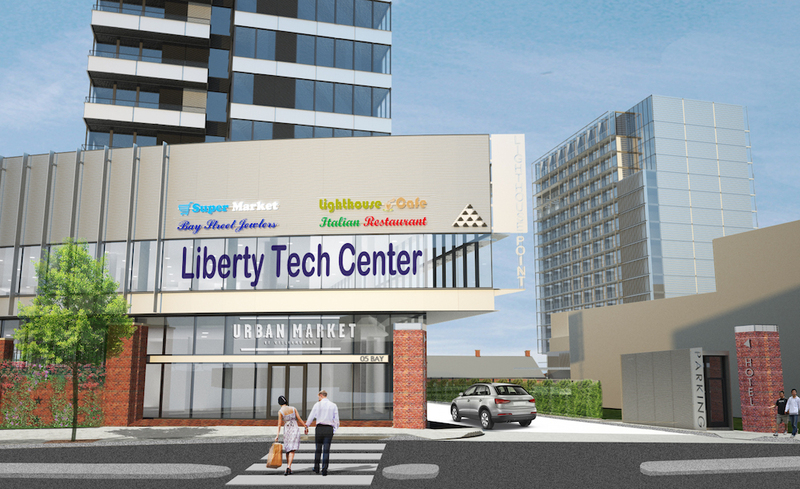 The retail component promises to bring a 15,000-square-foot grocery store, 7,000 square feet for restaurants, 5,000 square feet of office space, and 30,000 square feet for an anchor retail tenant or offices. A 12-story hotel with 180 rooms will complete the project, which aims to capture the nearly 2 million tourists who ride the ferry every year. 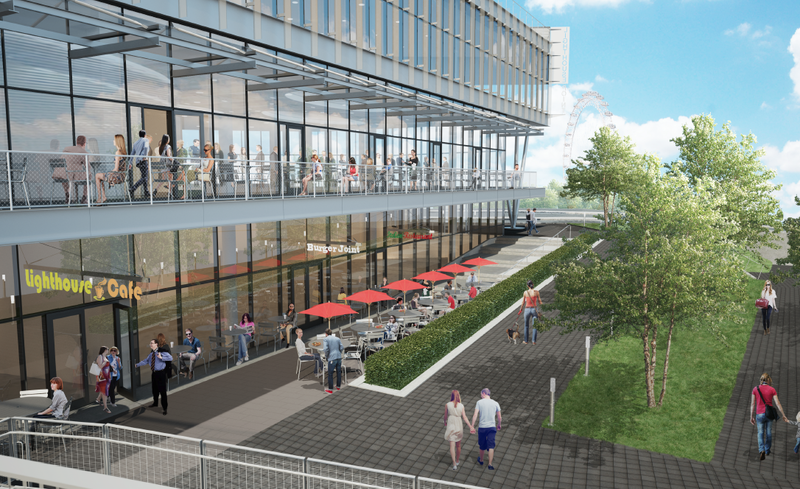 The public will be able to enjoy a promenade and pier along the waterfront, and the four crumbling Lighthouse depot buildings near the water will be transformed into restaurants, retail and office space. Triangle also plans to build a 400-space garage into the hillside, because building underground parking would be difficult in a flood-prone area like St. George. Garrison Architects and Cooper Carry are responsible for the look of the project, which just won an award for Excellence in Design from the city’s Public Design Commission. The developers behind St George’s three waterfront projects—Lighthouse Point, the Empire Outlets mall, and the New York Wheel—hope to make a mostly vacant swath of the North Shore into an attraction known as “Destination St. George.” New York Wheel developer Rich Marin told the Times that he expects 3.5 million people will ride the wheel each year, putting it on par with the Statue of Liberty. Construction is expected to start in the fall and wrap in 2019. 2 Comments on "New Look: Lighthouse Point, Big Mixed-Use Development in Staten Island"
Isn’t there any way to integrate that historic brick wall along Bay Street into the project? As can be seen in the third photo here, it just sits there like an anachronistic, crumbling vestige of past, grudgingly accepted by the developers as the price of doing business in St. George. I hope this improves the neighborhood because right now it’s a high crime area. Still it’s a positive development. Though I wonder if the 20% affordable quota will ultimately doom it over time as low-income tenants have destroyed every S.I.apartment complex that they inhabit.